Wrong-side Car – What Would You Do? I was driving down Diamond Heights Boulevard toward the Safeway. Just before you enter the parking lot, the road slopes down from the Stop sign and splits. It has a center divide with shrubs and trees, intersected by a couple of gaps that allow you to make a left when you leave the parking lot. The whole area is dimly lit at night. Prime accident territory. A few years ago, I saw a lady in an older car come out of the parking lot, trying to cross the median strip to turn left when another car came zooming down the road and hit her. They both ended up in the median; I hope no one was hurt. 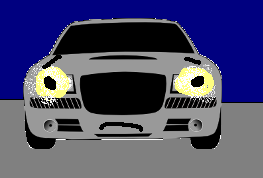 Today, I was just entering the dark downslope when I saw headlights … on the wrong side of the road. A car was facing me. He’d obviously exited the parking lot, missed the gap in the verge, and turned into the oncoming traffic. I could imagine a head-on collision happening in the next few seconds; it would only take one heedless driver going too fast. So I put on my hazard lights and angled my car across both lanes of traffic and stopped. All the wrong-side driver needed was a few minutes and a clear space to turn around. Most cars behind me stopped. A few beeped lightly, wondering what was happening. And a few others just nudged past my car. One driver just swerved wildly and zoomed by. My little car really couldn’t block a two lanes effectively. I was relying on other drivers to realize that something was wrong, and hoping they’d give the wrong-side guy a chance to turn his car. But evidently, not everyone did, or maybe they were in a hurry and didn’t care. It did however give the wrong-side car a chance to pull over out of the traffic. I pulled over myself and waited. When he had an opportunity, he did a 3-point turn and got himself facing in the right direction. Everything quickly cleared up. A few minutes later a police car cruised by, perhaps called by one of the people in the traffic. By then, there was nothing to see. But I wondered – what is the appropriate thing to do? What would you have done? Sound like your quick thinking was very helpful to correct the situation. Your question would be a good one for police.